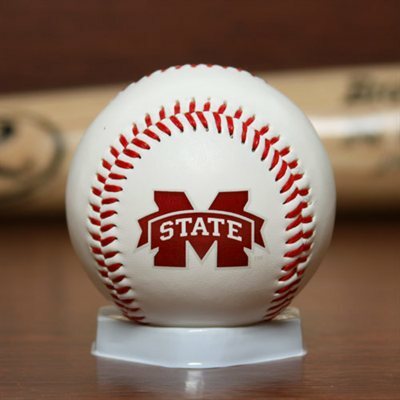 For all of Mississippi State Baseball’s success, the Bulldogs have never won a national championship. In 2013 they got mighty close, falling to UCLA in the College World Series finals and finishing the season as the nation’s consensus number two team. Will 2014 be the year coach John Cohen and the boys finally bring a College World Series championship trophy to Dudy Noble Field? 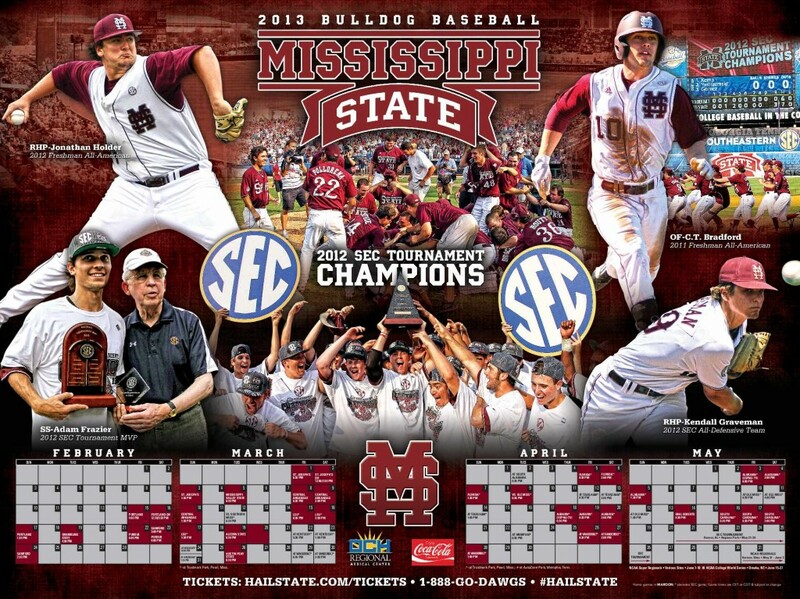 Mississippi State baseball’s 2014 schedule is below. The $ marks The Diamond Classic, presented by Polk’s Meat Products, and there is an asterisk (*) by all of Mississippi State’s Southeastern Conference (SEC) games. Fri, Feb 14 Hofstra Starkville 4:00 p.m. Sat, Feb 15 Hofstra (DH-1) Starkville 11:00 a.m. Sat, Feb 15 Hofstra (DH-2) Starkville 2:30 p.m.
Sun, Feb 16 Hofstra Starkville 1:30 p.m. Wed, Feb 19 Memphis Starkville 4:00 p.m.
Fri, Feb 21 Holy Cross Starkville 4:00 p.m. Sat, Feb 22 Holy Cross (DH-1) Starkville 11:00 a.m. Sat, Feb 22 Holy Cross (DH-2) Starkville 2:30 p.m.
Sun, Feb 23 Holy Cross Starkville 1:30 p.m.
Tue, Feb 25 Mount St. Mary Starkville 4:00 p.m. Wed, Feb 26 Mount St. Mary Starkville 4:00 p.m.
Fri, Feb 28 Michigan State $ Starkville 6:30 p.m. Sat, Mar 01 Eastern Illinois $ (DH-1) Starkville 11:00 a.m. Sat, Mar 01 Michigan State $ (DH-2) Starkville 2:30 p.m.
Sun, Mar 02 Eastern Illinois $ Starkville 2:30 p.m. Wed, Mar 05 South Alabama Starkville 6:30 p.m.
Fri, Mar 07 UC Santa Barbara (DH-1) Tucson 4:00 p.m.
Fri, Mar 07 Arizona (DH-2) Tucson 9:00 p.m. Sat, Mar 08 UC Santa Barbara Tucson 4:00 p.m.
Sun, Mar 09 Arizona Tucson 9:00 p.m.
Tue, Mar 11 Southern Illinois Starkville 4:00 p.m.
Fri, Mar 14 Georgia * Athens 6:00 p.m. Sat, Mar 15 Georgia * Athens 12:00 p.m.
Sun, Mar 16 Georgia * Athens 12:00 p.m.
Fri, Mar 21 Vanderbilt * Starkville 6:30 p.m. Sat, Mar 22 Vanderbilt * Starkville 2:00 p.m.
Sun, Mar 23 Vanderbilt * Starkville 1:30 p.m.
Tue, Mar 25 Southeast Missouri Starkville 6:30 p.m.
Fri, Mar 28 Arkansas * Starkville 6:30 p.m. Sat, Mar 29 Arkansas * Starkville 2:00 p.m.
Sun, Mar 30 Arkansas * Starkville 1:30 p.m.
Fri, Apr 04 LSU * Baton Rouge 7:00 p.m. Sat, Apr 05 LSU * Baton Rouge 6:30 p.m.
Sun, Apr 06 LSU * Baton Rouge 11:00 p.m.
Tue, Apr 08 Southern Miss Pearl 6:35 p.m.
Fri, Apr 11 Ole Miss * Starkville 6:30 p.m.
Sun, Apr 13 Ole Miss * Starkville 1:30 p.m.
Tue, Apr 15 Alcorn State Starkville 6:30 p.m.
Tue, Apr 22 Ole Miss Pearl 6:35 p.m.
Fri, Apr 25 Texas A&M * Starkville 6:30 p.m. Sat, Apr 26 Texas A&M * Starkville 2:00 p.m.
Sun, Apr 27 Texas A&M * Starkville 1:30 p.m. Wed, Apr 30 Jacksonville State Starkville 6:30 p.m.
Fri, May 02 Auburn * Auburn 6:00 p.m. Sat, May 03 Auburn * Auburn 3:00 p.m.
Sun, May 04 Auburn * Auburn 1:00 p.m.
Fri, May 09 Tennessee * Starkville 6:30 p.m. Sat, May 10 Tennessee * Starkville 2:00 p.m.
Sun, May 11 Tennessee * Starkville 1:30 p.m.
Thu, May 15 Alabama * Tuscaloosa 6:35 p.m.
Fri, May 16 Alabama * Tuscaloosa 6:05 p.m. Sat, May 17 Alabama * Tuscaloosa 1:05 p.m.